Inca Kola (also known as Inca Cola or "the Golden Kola") is a Peruvian soft drink with a sweet fruity flavor sometimes compared to bubblegum. The maker is 50% owned by The Coca-Cola Company. 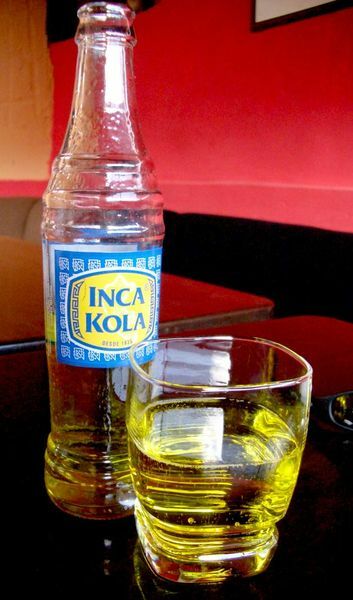 Inca Kola is exported to parts of South America, and while it has not enjoyed major success elsewhere, it can be found in Latin American specialty shops worldwide. Inca Kola is yellowish-gold in color, and sold in glass and plastic bottles of various sizes and cans of the same color with an Inca motif. Inca Kola is sold in supermarkets in the United States in 2 liter bottles, cans, and individual bottles. Inca Kola is available in Canada at many Wal-mart Supercenters.